The Bamboo Project: What is RSS and How Do I Use It? You know how you get really busy and forget to visit a blog or website to see what new information has been posted? Wouldn't it be nice if there was a way for that information to come to YOU, rather than you having to remember to go find it? That's where RSS comes in. RSS stands for "Really Simple Syndication." It's simply a way for new information to come to you whenever it's put online. You don't need to worry about the technicalities--just how to use it. On my blog, there are two ways you can be notified when I post new information. 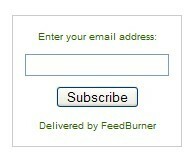 Simply enter your email address and then click on "Subscribe." You'll then receive an email notifying you when I add new posts or information. Most blogs and news sites now use RSS to notify readers of new content. Sites that do provide updates using RSS will have one or more of the icons you see on the right. If you want to follow a number of different sites, then it's better to use an RSS reader, rather than to be updated by email. With a reader, you can follow many different sites without cluttering up your inbox. To learn more about RSS and how you can sign up for a reader, watch this video, RSS in Plain English, from Common Craft. It will tell you everything you need to know. You can also check out this great Beginner's Guide that will introduce you to everything you wanted to know about using RSS. Setting up a Google Reader account so information is automatically added from many of the sites you regularly visit should take about 15 minutes if you follow these instructions. Open your browser, go to www.google.com/reader and click on the link on the right-hand side that says ‘Open an Account Now’. • Enter Your Current Email Address – Google will send the verification email to this address, so make sure that you provide a real and active address. • Word Verification – This makes sure that you are a real person and not a bit of Internet software! The screen will then display the ‘I accept. Create my account’ button. You will be sent an email to verify that your email address is live and working, so go and find this in your inbox to enable your account. It will have been sent from accounts-noreply@google.com and will have the subject line ‘Google Email Verification’. You verify the email by clicking on the link in the email. This will open your Google Reader page. When the Google Reader page opens for the first time, you will have the opportunity to watch a 30-second video by clicking on the ‘Play’ button at the bottom of the video window. This is worth doing. Once the video is finished, click the ‘Get started by adding subscription’ button. This takes you to a screen where you can start adding some websites chosen by Google. Google has bundled some sites into groups – News, Sports, Fun and many more. I wouldn’t bother choosing a bundle. I prefer to choose individual feeds in which I’m really interested. To do this, click on the ‘Add Subscription’ link in the left-hand column. This opens a search field with which you can find feeds to add to your Reader page. You can make the search either very specific to find the feed on a particular website (for example, ‘BBC UK sports news’) or much broader to find feeds about a particular subject area (for example, ‘gardening’). Once you have identified a feed you want to add, you simply click the ‘Subscribe’ button. The button immediately changes to a yellow tick and the text ‘Subscribed’. At this point it is very useful to assign the feed to a folder. As you add lots of feeds it is much easier to manage your Reader site if they are bundled into folders. To do this click on ‘Add to a folder’, which appears under the feed once you have subscribed. Click ‘New folder…’ and type in a relevant category name – news, sports, small business, etc. Repeat this process to add more feeds. Congratulations! You have now taken a big step towards making your information consumption much more effective.